Located South of the Imperial Palace Grounds, the Imperial Hotel in Tokyo overlooks the Palace, Hibiya Park and the Ginza neighborhood. The first Imperial Hotel was created in the late 1880's and the second generation Imperial Hotel, which was designed by the famous American architect Frank Lloyd Wright, opened in 1923. The main tower of the present Imperial Hotel has 17 floors and was constructed in 1968. The hotel boasts original artworks inspired by Frank Lloyd Wright's work and the Old Imperial Bar has an original 1923 fresco. Fascinated by the rich architectural history of the hotel and being a fan of Frank Lloyd Wright's work, I decided to stay at the Imperial Hotel during my visit to Tokyo in the summer. As an Imperial Club member, not only did I enjoy priority check-in but was also given a room in the hotel's main tower building. My room overlooked the Imperial Palace and the Hibiya Park. 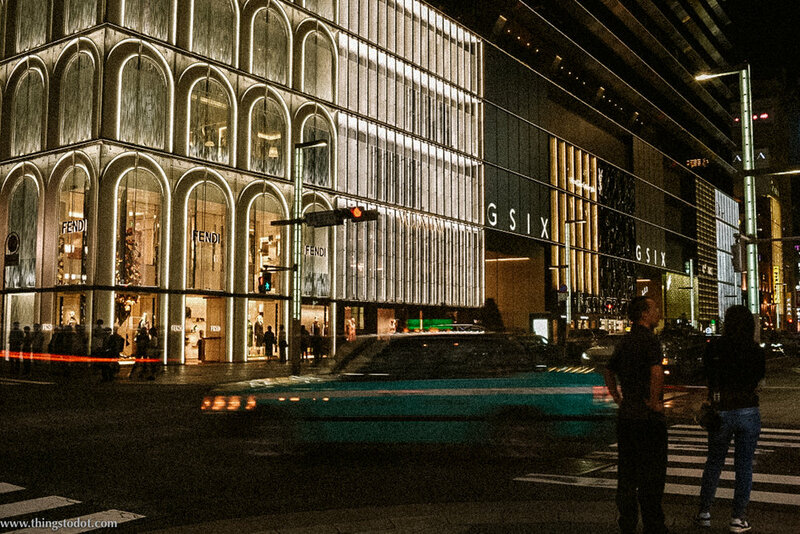 After settling down in the beautiful luxurious room, I picked up my camera and walked to the Ginza shopping district. The streets were bustling with activity in the late evening hours. I was very quickly distracted from my photography by stores such as H&M and Zara, where I spent the rest of the evening browsing through the latest in fashion and accessories. Back at the hotel I had arranged for a midnight in-room traditional Japanese Shiatsu massage. It was also one of the highlights from my stay at the hotel. An old Japanese lady with a hunched back who could not speak any English, punctually showed herself at my room door at 00:00 hours. Unpacking her little briefcase which carried her massage supplies, she got to work for the next one hour. Shiatsu can work the tension and spasms out of the muscles by rubbing and pulling at the skin and muscles, and by pressing on acupressure points that release tension. The next afternoon before checking-out I spent time looking at Frank Lloyd Wright's exhibits of the old Imperial Hotel in the hotel lobby. I also enjoyed a traditional Japanese lunch at one of the hotel's restaurants before taking the shuttle to the airport. My stay in Tokyo at the Imperial Hotel couldn't have been better and I highly recommend this hotel to anybody who wants to enjoy true Japanese hospitality while being centrally located in one the best districts of Tokyo - Ginza.